Google has introduced a cool feature to display the profile and picture of the author of content in the Google search results. Learn how to configure your profile to make this work for your posts in this site. You may have seen the recent announcement from Google that it can display the author profile information and picture in the Google search results. To make this happen, Google must have a Google+ account and connect it to your profile page in this site. There are some complexities involved in this process since Google should have a fool proof way of figuring out who is the actual owner of any website. Google cannot make any guesses or cannot read the name of author printed in the page. Instead, it depends on some sophisticated configuration in the site and in your Google+ profile page itself. The good news is, we have done all the background work for you. We have added the necessary meta tags in this site and in all the relevant content pages. Before you proceed, make sure you have specified your Google+ profile id in the social settings page in this site. Go to your Google+ account. Now look at the url of the page. You will see a long number, about 20 letters long. Copy this number without taking any other part of the url. This number is your Google+ profile id. Once you specify your Google+ profile id in the social settings page of this site, you must go to your Google+ account and verify the relation between your profile in this site and your Google+ account, so that Google will know you are not specifying someone else's profiles. Before you proceed with the steps to verify the relation between your author profile in this site and Google+ account, make sure you have specified your Google+ profile id in the social settings page in this site. 1. Go to your Google+ profile page. 2. Click on your name in the leftbar so that it will display your profile page. 3. Click on "Edit Profile" button on the right side. 4. Look for "Contributor To" section on the rightbar. Click on it. 5. Click on "Add custom link" link. 6. In the first field, give a custom name (can be the name of this site). 7. In the second field, type the full url of your profile page from this site (not AdSense profile but the regular member profile page) in this site. 9. Click "Finished Editing" in the top of the page. 11. Now it is time to test and make sure everything works. 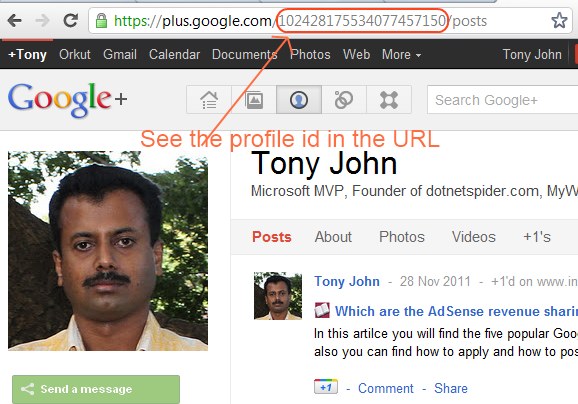 You can verify the link between your profile page and Google+ account in this page. Alternatively, you can check this link at the Google website. Go to the Rich Snippets Testing Tool and copy paste the url of one of your Resources from this site. Click preview. If it comes up with the message "Verified: Authorship markup is correct for this page" for your resource, everything is great. It may take several days before Google can figure out the connection between your Google+ profile and your content pages in this site. Wait patiently for few days and then search for some text in your article within double quotes. If it appears in Google search results along with your photo, you are done it successfully. Start sharing your articles in Google+ and get better traffic.